Ismailia Association International Review Meeting Nairobi 1980 | Ismaili.NET - Heritage F.I.E.L.D. 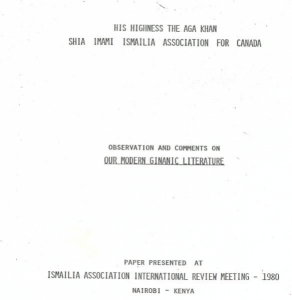 This is the paper presented at the Ismailia Association International Review Meeting in Nairobi, Kenya on 1980 by the Ismailia Association for Canada. The paper explains how some articles of the report by Rupani of the Paris Conference 1975 have created some mis-representations and how some Ginans books printed by the Ismailia Association for Pakistan were in fact against the decisions and the spirit of what Our beloved Imam said at the Paris Conference. The report is endorsed by President Amirali P. Haji of the Ismailia Association for Canada who attended the Conference in Paris in 1975. The complete Report is attached here in PDF format. The second part, Appendix 1, Review Sheets has been added as the scans are now completed. - the second part provides a comparative analysis and comments on some major changes that have taken places in Ginan books published after the Paris Conference 1975 by Ismailia Association for Pakistan (Though Pakistan has not been named specifically) outside the directives of the Imam.